I just finished up Mull’s Major Taylor bike:) I am very happy with the way it came out in the “Rushin Revolution” theme “Black and Red” http://www.rushinrevolution.com/ Mully originally from MA, but sent to Chicago working for Zipcar http://www.zipcar.com/index and also once a writer for the Ride Magazine. This bike has been several years in the making for Mully and I am very glad to finally have him as an ANT rider…well after NAHBS he will get his bike;) This is the first of the three show bikes [customer orders] I am building for NAHBS http://www.handmadebicycleshow.com/2008/ Next bike in line for NAHBS is David P from Texas. 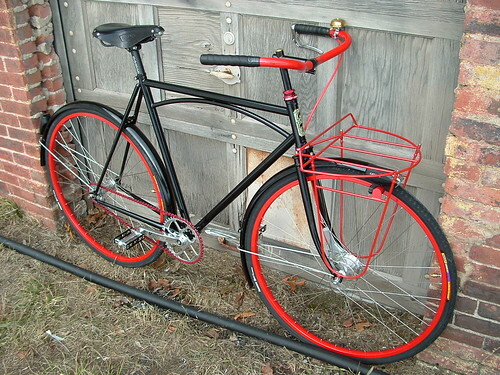 He is a getting a very nice looking Roadster with the Alfine 8 speed hub set. Build shots and picturs of the bike to follow soon. Welcome home from the show. I read abt your business on cyclingnews.com and just looked at your site and blog. I have mixed feelings about many of the handbuilt bikes ’cause I’m afraid they’ll never be used. Yours have restored my faith. We have a million friends in common, as you may know. If you talk with Joe Young or Cinco, please pass along my regards. Been years. My buddy Justin is looking at wintertime bikes and several of your models are right down his alley. I sent him a link to your site. I hope you had fun in Portland and I hope you get rich making bikes people will use and love! Keep the right side up, up, and away from the dump trucks! Beware garbagemen and their barrel-tossing ways! And always avoid the slippery and stinky garbage juice! At least you have fenders for that now. Yeah, what NoWay said. But I thought you got creamed by a dump truck – so beware of rocks, too. Mike, Mully’s new ride is sweet. And it’s great to see that you’re getting the recognition at bike shows that you deserve. I just saw this very bike here in Chicago a few days ago, locked up outside a hotel bar–I think it was the first antbike I’ve seen in real life, actually. Very nice…it really stood out.